A cinema in the comfort of your own home. WebcentrikAV can specify and install a fully integrated system capable of DVD and Bluray playback, as well as terrestrial TV, SKY HD or cable, games consoles and web browsing. Whether you would choose to integrate a home cinema system into an existing room or purpose built area, high end components are always used ensuri ng your fitted cinema will delight and entertain for years to come. Flush mounted in-wall or in-ceiling speakers, which can be painted to the same colour as the room. The latest wall mounted screens without visible cables, all are hidden in the walls. 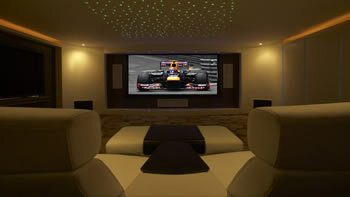 High Definition home cinema video projectors with electrically operated screens. Media servers to store your DVD, Bluray and music collections for playback at the touch of a button. Custom programmed remote controls to give you ultimate control over your cinema. We work with a wide range of specialists who can provide you with bespoke joinery or racking to house your equipment. Cabinets to hide the television screen which can be raised on a motorised mount when required.